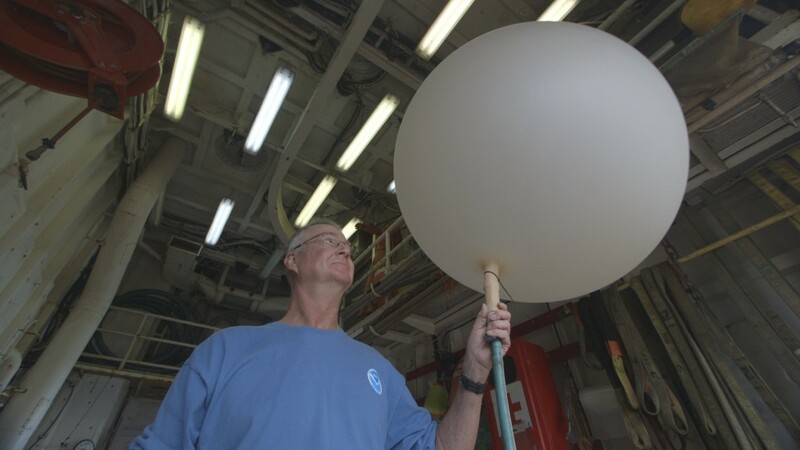 Dan Wolfe is a “balloon man.” He has released weather balloons into the sky for the National Oceanic and Atmospheric Administration for more than 40 years. Weather balloons carry devices called “radiosondes” into the atmosphere that transmit temperature, pressure, location and humidity data as the balloons float upward. There are more than 800 radiosonde launch sites in the world. Balloons from all of these sites are launched simultaneously twice a day. “This gives meteorologists a snapshot of the Earth’s three-dimensional atmospheric conditions, according to NOAA’s website. Some are launched from research vessels in “data poor” regions, like parts of the Pacific Ocean, where it is difficult to get regular readings from the ground. It takes about 90 minutes for Wolfe’s balloons to reach a maximum altitude of 70,000 feet. That’s when the balloon expands so much that it pops, and the radiosonde plummets back to Earth. But until then, the sky’s the limit. Editor’s note: Watch Miles O’Brien’s report tonight on the PBS NewsHour on efforts to better understand El Niño weather patterns.